Being scottie obsessed is a moniker I wear proudly, you know what I’m talking about. Owning a scottie dog, I mean being owned by a scottie dog includes sporting a scottie sweater or two. I have a few gems in my own collection, like a stapler, the Dooney bag (that we all have), an awesome pair of shoes and a scottie dog tattoo. Yup I have a Pippi tattoo. Josh’s brother, an artist, created this sweet design to cover an old star tattoo. It’s Pippi but a fabulous vintage version of her. 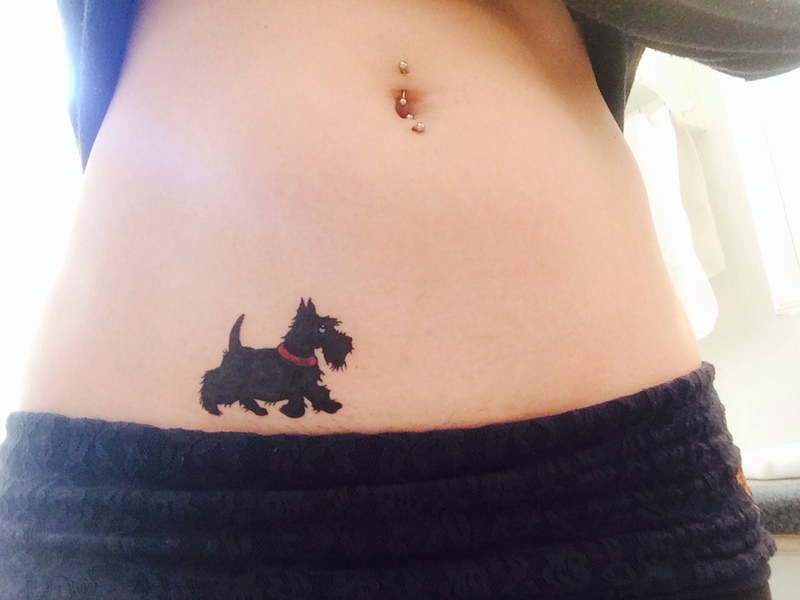 This entry was posted in Scottie Stuff and tagged dog tattoo, pet tattoo, Pippi, Scottie, Scottie dog, scottie tattoo, Scottish terrier. Bookmark the permalink. I’m going to miss the leech. But somehow having Killer Dog there in its place will make me smile. OH MY DAWGNESS. Aside from being a Scottie tatoo, which is awesome in and of itself, IT’S A DARNED GREAT TATOO!!! Here’s to Miss Pippi!!!! And you, too, for that matter.